Packing for a trip can be challenging. Packing for long-term, extended travel can be a nightmare. And while minimalists tend to assume this stuff will be a breeze—”I only have 3 shirts anyway”—it doesn’t always work out that way. Turns out you kind of need things like toiletry containers, outlet adapters, and other random things in order to keep living your life semi-normally on the road. Luckily, we’re experts in this kind of stuff. Check out the video or read on to discover ten tips from the Pack Hacker team that will help you keep things minimal and pack better for your next trip. 10 Minimalist Packing Tips For Your Next Trip from Pack Hacker on Youtube. One of the best ways to figure out what you need to take on a trip is to lay out everything in front of you, either on a table (if you’ve got one big enough) or the floor. To really keep things minimal, we suggest trying to cut everything in half. Don’t literally cut your clothes in half, but try to take half the number of items you initially think you need. You’d be surprised what you can get away with. Storing your stuff—preferably all of it—in packing cubes or pouches keeps your gear organized and lets you to easily find what you’re looking for. We love packing cubes, but even a plastic grocery bag or a Ziploc can work wonders. Pro tip: We recommend grabbing a few different sizes and colors so you can hold a variety of items and easily remember which cube has which stuff. Always be on the lookout for items that can serve multiple purposes. Here are a few common examples: a compressible lightweight jacket can double as a pillow, a buff can double as a scarf/hat/eye-mask, and one multi-use adapter can eliminate a few cords. Versatile items are the key to keeping things minimal and optimizing your travel kit. 4. Get some merino wool. If you travel often and you’re not rocking some merino wool…you’re doing it wrong. Seriously. Between the anti-microbial properties and multi-climate usage, you really can’t go wrong. If you’re looking to pack light, you pretty much travel perpetually with two of everything (shirts, socks, and underwear), if they’re all merino wool. This way, when you do need to wash your stuff, you can wash/dry one outfit while you wear the other. We love this stuff—that’s why we wrote an entire guide on merino wool. Pro tip: No one cares if you’re wearing the same clothes! Especially when you’re traveling, most people won’t even notice. They will, however, notice if your clothes stink. So don’t let that happen. Let’s not beat around the bush—things can get a little grimy when you’re traveling day in and day out. In order to keep your pack—and the contents in it—fresh, we’d recommend throwing a cedar wood chip in. It’ll keep everything smelling nice and keep any bugs away from your stuff! (Shoutout to tip #3.) Dryer sheets, essential oils, or potpourri sachets can work here too, though we tend to prefer the natural cedar scent. 6. Get some solid soap or a shampoo bar. And to be clear, we mean non-liquid soap. (Yes, you should still get some “solid” soap, as in good soap, but the gist is that bar soap is better for travel.) There are countless benefits here—solid soap doesn’t eat into your TSA liquid restrictions, it takes up barely any room, it lasts a long time, it’ll keep your bag fresh and, if you get the right bar, you can even use it for shampoo, laundry, and dishes. Boom. 7. Bring a compact bag. Having all your necessary in-flight items—like water, snacks, headphones, etc.—close to you during your trip can be the difference between an enjoyable flight and a miserable one. If you’re using packing cubes or pouches, consider grabbing one that can pull double-duty as a sling for your time at the airport and on the plane. At the very least, keep that pouch accessible at the top of your pack so you can grab it as needed. 9. Strategize to save money. At the end of the day, a lot of this stuff is up to you. That is why we always recommend practicing your trip beforehand by loading up your pack and going about your daily routine using only the items inside. Do this for a couple days or weeks and you’ll quickly figure out what you need, what you don’t need, and how you’d like to configure your pack. Nothing motivates a material detox quite like moving to a new apartment does. Before moving, I was motivated to reduce the amount of material objects I owned (which meant less for me to pack) and to approach life through the lens of less. You never realize how much stuff you have until you’re forced to pack your life into a million different boxes. With the help of Marie Kondo’s The Life Changing Magic of Tidying Up, my space emerged from the process delightfully spare (sort of), and it felt pretty damn good. Now, when I talk about paring things down, I’m not talking about extreme, buzzy and trendy minimalism, the kind where you get rid of practically everything you own. Extreme minimalism is simply a different form of cultural capital when it comes to owning things, even if it is less. Radical minimalism can take up just as much time and space in your mind, causing stress just as much as clutter might. As ubiquitous as the concept of minimalism is and how to practice it, it’s easy to forget why we do it and what you actually get with less. When I moved, I didn’t go crazy and get rid of everything I owned, I got rid of the things that were causing me more stress than they were doing good. So, when I talk about material detox, I’m talking about the kind of minimalism that feels right for you and the kind that leaves you feeling whole—not uncomfortably naked (figuratively and literally). After a successful purge of unnecessary material objects, I realized there were a lot of unforeseen benefits to minimizing the things I owned. The less things I own, the more time I seem to have to myself. I quickly realized I was spending much less time agonizing over what to wear and less time packing for trips because I know my closet’s items more intimately and because my wardrobe consists only of items I look or feel good in. Another example: I spend less time sorting through kitchen utensils to find the right one while cooking (why did I think I needed three of the same type of spatula? ), and less time cleaning and organizing—it’s amazing how easy it is to keep organized when you have less items to clean and organize. With fewer things to pick up and put away, fewer things to collect dust, and fewer things to move in order to vacuum, my cleaning routine sped up a significant amount. That means more time and energy spent in the places I want, like out surfing or hiking. Marie Kondo’s book suggests filling your life with things that trigger happiness, which implies we have an emotional connection with the things we decide to keep. This decision isn’t simply about what we choose to have around us; it’s deeper. It’s about the things we want as part of our life. It’s about who and what we are loyal to. By ridding my apartment of the unnecessaries, I was enabled to be more mindful and aware of the things that were taking up space in my life both physically and mentally. According to psychologist Sherrie Carter, clutter can “bombard our minds with excessive stimuli (visual, olfactory, tactile) and cause our senses to work overtime on stimuli that aren't necessary or important.” With less clutter, my environment no longer feels chaotic, and I now look forward to coming home and relaxing. All that clutter really affected me and it’s only now that I can refocus on the things I find most important. With renewed focus on the things I own, I began to spend much less. I started to only spend on the things I needed, or the things that brought me real joy. It wasn’t easy at first, but thinking a second longer around the impact of the purchase I was about to make helped me step out of the consumer cycle and fight the thrill of a purchase. Not only am I saving money on things I don’t really need, I’m also wasting less. The less you have, the less you ultimately waste. And now I’m going to continue selling and recycling the things I don’t need. All this minimalism seems to be doing wonders for my well being. Unfortunately, while my material world is looking more orderly, my virtual world is not. My phone and laptop remained a cluttered hodgepodge of applications. Do I really need three different to-do list apps? Clearly I still have a problem—a virtual hoarding problem. Looks like it’s time to apply the same sort of practice to my virtual world. How do you deal with loved ones who, as an expression of their love, want to buy you stuff?” How do you get them to “cut it out without hurting them”? Andy raised a similar but far more interesting question. It’s different from the question of what to do with stuff you already own that you don’t need (the subject of a future post). And it’s more difficult one to manage, because it’s not just you who needs to take action; you’re trying to change someone else’s habits. And habits can be tremendously hard to change. Plus, who could file a grievance against someone who just wants to take care of others? It’s a tough case to make. But for the sake of argument, let’s go a little over the line with our analogies: If, as they say, one is not an alcoholic when they’re drinking with others, then one is not a shopaholic when they’re shopping for others. Take away the “others,” and all that’s left is a bad habit. 2. Bargaining: Asking politely doesn’t work on everyone, and that’s when it’s time to start negotiating. Try the sandwich approach—delivering the “meat” of your argument between two positive slices. 3. How About Some Light Anger: Negotiation doesn’t always work. “My mom has always been the gift-giver, and she’s very motivated to try to ‘outsmart’ my minimalism to buy me something I didn’t even know I wanted,” Chris writes. “My conversation with her is ongoing, but I’ve had to employ tough love at times.” Just don’t be too tough. In fact, it’s safer to skip this stage. 5. Acceptance: You can change your own mindset, by accepting the fact that it just might bring someone as much joy to hunt for things and pay for them as it does to actually give them to you. If that’s the case, then you might try giving up on trying to change them and “live and let live.” In which they give you stuff and you give it away—giving as little effort and feeling as little anxiety as possible. Hopefully that doesn’t mean throwing it away. Sell it. Give it to a friend. Drop it off at Goodwill. And feel good about it. Whether anything you try will work, as Chris wrote, “it depends on the loved one.” It also depends on you. One week from today—noon Pacific Time on Monday Oct. 15—the blogger, author, and coach Tynan will join the Only What Matters community for an Ask Me Anything. Tynan has written extensively about all kinds of topics of interest to us. He’s traveled full time with only a small backpack. He’s written about “the two main things worth building in life… an amazing group of friends and enough money to survive for a long time.” He’s put in time thought over many years to design a lifestyle focused on (you guessed it) only what matters. Members can participate in the Tynan AMA. Non-members can join now—for free, by the way. Just make sure to sign up in advance, so you have time to get familiar with the community. WHERE: Inside the www.onlywhatmatters.com members-only area. Doing more with less isn't easy. It takes practice. And one way to get a lot of practice? Try living in a van. Here's a shot of my wife Caitlin on our honeymoon in Norway. We lived out of this van for just 6 days, and I can confirm that it's no picnic. Sure, it's a lot like moving constantly from picnic to picnic. But the difference is your picnic basket contains all your clothes and supplies, and gets 20 miles per gallon. "Van life" does have its perks. I'll spare you the full vacation slideshow, but we toured the epic coastline of the Lofoten Islands, explored beautiful Norwegian fishing villages, and made our best attempt at hiking like the Norwegians. And we got to spend entire days in places we never would have made it to otherwise. It was everything we hoped for and more. And "more" included a few downsides. Like that time that Caitlin decided to air out her socks by hanging them above my pillow. Or that time that I overheated in the middle of the night and spent five minutes struggling to delayer. Or that time that we thought someone was pranking us only to find a herd of goats rubbing up against the side of the van. All that makes the prospect of living out of a van full time a daunting one. But people do it, and they seem to love it. The New Yorker profiled Emily King and Corey Smith, who run @wheresmyofficenow on Instagram. They fund their life on the road—and days spent kayaking, mountain biking, and driving through national parks—through product placement in their #vanlife posts. They've been at it since 2015, which makes them total pros. But even after all these years, I bet they'd be the first to say they have yet to perfect their already very minimalist lifestyle. Take an example. In May 2018, Emily and Corey decided to remodel their van, which they named Boscha. An Instagram story revealed one thing they could use less of: clothes. Corey: "You've been packing your clothes for four hours—like, I tore apart the whole van." Emily: "That's true. It's a lot of clothes." Again, it's hard. These are professional minimalists, who live out of the tiniest mobile home: a van. If their wardrobe can be allowed to get out of hand, what hope do any of us have? The good news is we have something more practical than hope. And it's also more tangible than "a minimalist philosophy." Because minimalism is a practice—and it takes practice. It's not something we have, it's something we will always aspire to have—no matter how good we get at living the dream, in a van, down by the surf. Here's what we do have. Instead of trying to figure it all out on our own, we have a community of people who are all working together to own less, waste less, and do more of what we love. That's what Only What Matters is all about. It's the place to share tips and tricks, and lessons learned. To build on what others are doing. To help others avoid the mistakes we made. And to enjoy the experience—the practice—with people who have the same values we do. What does the community discuss? Minimalism is a privilege of the wealthy and something that many families can't fully participate in because it's financially unsafe to declutter. 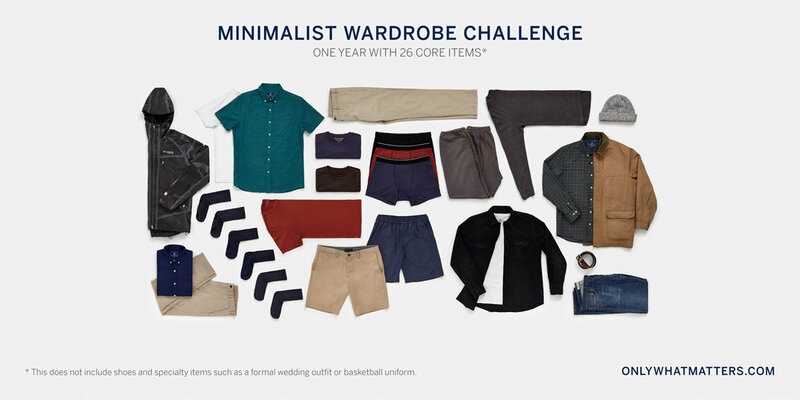 Minimalism actually encourages more consumption. "This new minimalist lifestyle always seems to end in enabling new modes of consumption, a veritable excess of less. It’s not really minimal at all." Minimalism is trendy, and trendy movements and their leaders can be annoying. The Minimalists were in town on their Less is Now tour and I was lucky enough to get a seat at their sold out show. Overall, The Minimalist's message of living simply is good for the world, but the deafening self-promotion (check out our NETFLIX documentary, listen to our podcasts, buy our books) dilutes their message. Eventually the Minimalists and other bloggers in the space run out of content and digress into the blackhole of self-help. Whether you know it our not, the era and environment shape your perspective on owning things. "Kondo says that we can appreciate the objects we used to love deeply just by saying goodbye to them. But for families that have experienced giving their dearest possessions up unwillingly, “putting things in order” is never going to be as simple as throwing things away. Everything they manage to hold onto matters deeply. Everything is confirmation they survived."